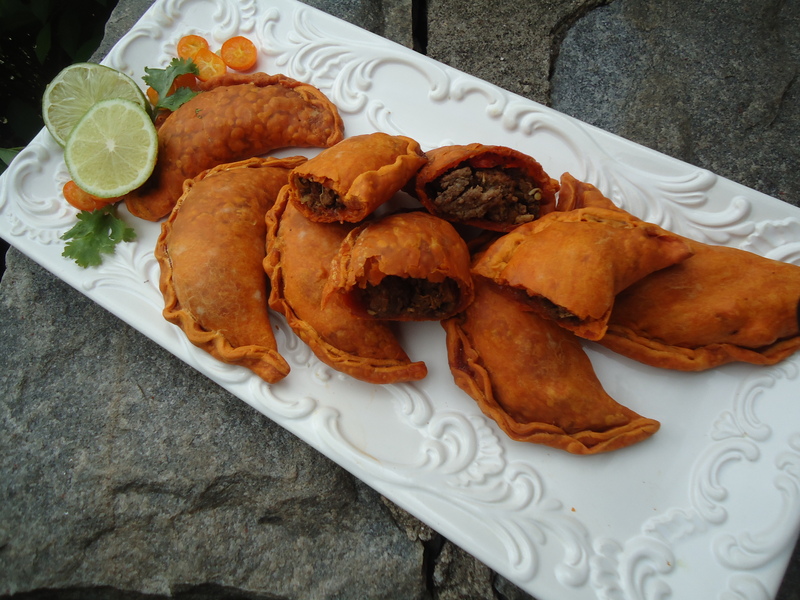 Who doesn’t love Empanadas….the delicious little turnover pastries that ca be stuffed with vegetables, savory meats, cheeses, sweet jellies, jams or anything else that a true foodie desires. Another great filling for empanadas can be leftover meatloaf, a spaghetti meat sauce, mashed potatoes and cheese, or even spinach and bacon, for a twist. Just about every Latin country has a version of empanadas with variations of dough and fillings. Some are fried and some are baked. Lately, I have been looking for more healthy alternatives for my for some of my favorite foods. The recipe presented here, are made with ground turkey and a homemade dough infused with ground annatto seeds for color and for taste. But if you are short on time, Goya now makes a line of empanada discs, both plain and annatto flavored. They can be found in the frozen section in most local grocery stores. If they are not available, make sure to inquire with the manager at your local supermarket to see if they can be ordered for you. Combine the flour, baking powder, sugar , annatto,and salt in a large bowl. Cut in the lard with a pastry blender or 2 knives until the mixture resembles coarse cornmeal. Lightly flour a work surface and roll out the dough to 1/4 inch thick. Cut out 4-, 5- or 6-inch rounds, depending on how large you prefer.Layer cut sheets of wax paper between each disc before you stack them, then wrap and set aside in the refrigerator until ready to use. Heat olive oil on medium heat until shimmering in large cast iron skillet. Add the ground turkey and season with salt and pepper. Use a wooden spoon to break the meat up into small pieces. When meat is no longer pink, drain all liquid from pan. Add the onion, garlic, green bell pepper, red bell pepper, jalapeno,tomato,cilantro and cumin to the skillet.Add tomato sauce and mix well into the meat and vegetable mixture. Reduce heat and simmer covered about 15 to 20 minutes. The mixture should be moist but not dripping wet. Set aside until you are ready to fill the empanadas. 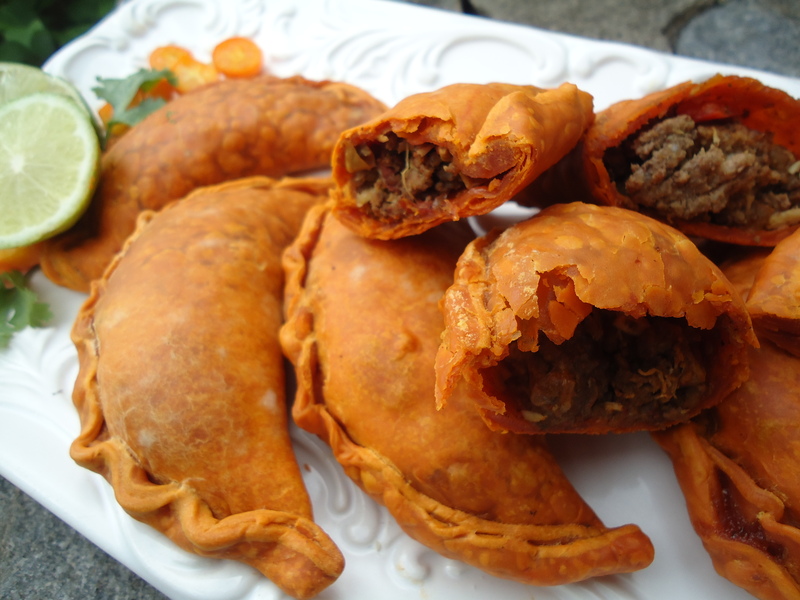 Add about 1 tablespoon of the meat filling to each empanada and fold the dough over in half to enclose the filling. Using your fingers, crimp the edges or use a fork to press and seal the edges closed. You can refrigerate the uncooked empanadas for up to 3 hours. Preheat the oven to 400°F.Line two cookie sheets with parchment paper and lightly spray with vegetable cooking spray. Gently transfer each empanada onto the cookie sheet and lightly brush the top of the empanada with egg wash. Bake for 12 to 15 minutes, until golden brown. Allow to cool before eating, the filling will be extremely hot. Goya makes empanada disks and can be used instead of making your own dough if you are pressed for time.